A general view of the Kalntari oil dock of the Sea of Oman near the strait of Hormuz in the city of Chabahar, south-eastern of Iran. Officials from India, Iran and Russia recently met in New Delhi and approved draft transit and customs agreements for the International North South Transport Corridor (INSTC). The three countries and ten other countries, from Central Asia, the Gulf and East Europe forming the INSTC coordination council, met and approved draft agreements which will provide a legal basis for freight movement in Eurasia. The southeastern Iranian port Chabahar is a crucial link in the INSTC. 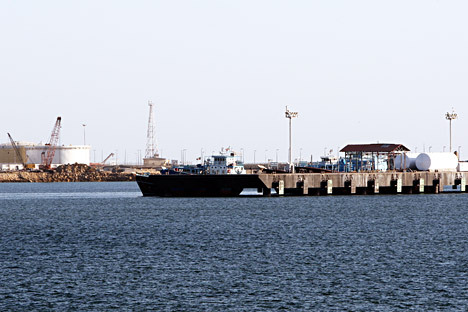 India signed an agreement with Iran in May 2015 to develop this port. The multimodal transport link, when operationalized, will galvanise Eurasian trade. India’s Transport Minister, Nitin Gadkari visited Tehran to give concrete shape to the Chabahar development project, conceived over a decade ago but stalled due to international sanctions on Iran. With the sanctions girdle set to loosen, India’s involvement in developing the port will be crucial. Chabahar will be connected to Milak, close to the Afghan border, and into Afghanistan through the Indian built Zaranj-Delaram highway. This section is part of the broader INSTC project that links Eurasian nations, from Russia in the north to India in the south, through Central Asia. The corridor can further be linked to the Silk Road, and other networks of roads linking China to Europe. Though estimates vary, transport costs and duration will be minimized when this corridor becomes operational. According to Gadkari, “It is expected that cargo by this route (INSTC) would reach Russia in about 25-30 days as against the present route through Suez which takes about 45-60 days”. During his visit to Russia earlier in May 2015, Indian President also referred to this transport corridor. The $85 million Indian investment in Chabahar will provide India a ten year lease of two berths, one of which will be used for container traffic and the other for multipurpose cargo at the site. S-300 supplies: Is Moscow sending a signal to Tehran? During his visit to Russia in July 2015, for the BRICS and SCO summits, Indian Prime Minister Narendra Modi raised the corridor issue with leaders of Russia and Central Asia. Earlier, in June, a stakeholders’ conference in Mumbai by India’s Commerce and Industry Ministry and Federation of Freight Forwarders’ Associations in India (FFFAI) discussed the issue. Iranian Foreign Minister, Javad Zarif, visited India last month and met his Indian counterpart, Sushma Swaraj, Gadkari and Prime Minister Modi to discuss bilateral cooperation, including Chabahar port and the INSTC. Commenting on Zarif’s visit, Indian Foreign Ministry spokesperson Vikas Swarup said, “We are at an advanced stage in two ongoing projects related to Chahbahar and the International North South Transport Corridor (INSTC).” Zarif told reporters, “I believe sooner rather than later we will start serious work.” Both sides also discussed energy cooperation and transforming the relationship from a buyer-seller relationship to a ‘genuine energy partnership.’ Iran has offered to build a rail link from Chabahar to Zahedan, capital of its Sistan-Baluchistan province, as part of the larger INSTC project. Pakistan does not provide India overland access to Afghanistan. Development of Chabahar will provide India access to Afghanistan and other Central Asian countries. Particularly in Afghanistan, it will help India carry forward its humanitarian work, and help build Afghan forces and democratic structures for a more stable Afghanistan. It will help India to access energy resources in Iran and Central Asia and help turn Eurasia into a hub of economic cooperation. A comprehensive economic partnership agreement between India and Eurasian Economic Union will increase economic cooperation in the region and give a boost to India’s connect Central Asia policy. India’s investment in Chabahar will also help counter maritime piracy and tackle other mishaps and disasters at sea. A zero sum perspective and compartmentalization keeps relations confined to a narrow realm of geopolitics at the cost of economic advantages. India’s involvement in Chabahar can complement China’s involvement in Gwadar. The two ports are located at a distance of about 72 kilometers. A mutual understanding between India, Pakistan, Iran, China and Russia will not only be mutually beneficial, but also help in giving concrete shape to projects languishing long such as TAPI and IPI. At present it appears difficult. Sunni dominated Pakistan has differences with Shia dominated Iran. The decades old Indo-Pak rivalry over Jammu & Kashmir, and India-China border differences have contributed to a tunnel vision. India and Iran share huge cultural capital. The two countries shared a long history of trade through the ancient Silk Road. Once the sanction regime is totally over, Iran’s relations with BRICS countries will likely flourish.